STICK FRAME. New construction. READY TO BE BUILT. Actual photos of the lot but house photos are from another house...2380` sq ft. Colonial offers many great amenities...2 car attached garage. Customize your own: roof, siding and shutter colors, kitchen cabinets, ceramic tile and carpet flooring...etc. TOWN OF SHAWANGUNK w/ Pine Bush schools close to Gardiner & New Paltz is abundant in history and natural beauty many world travelers call this area one of most beautiful parts of country w/its scenic mountains and farmland. Just 90 minutes to NYC. 9 ft. high ceilings on 1st floor, 4 bedrooms 2.5 bathrooms. Spacious family room w/fireplace, Eat-in kitchen w/ island and granite counter, ceramic tiles, h/w floors, c/air. Formal dining room & living room, deck overlooking spacious surroundings on 1.7 acre lot. Walk-out unfinished basement. 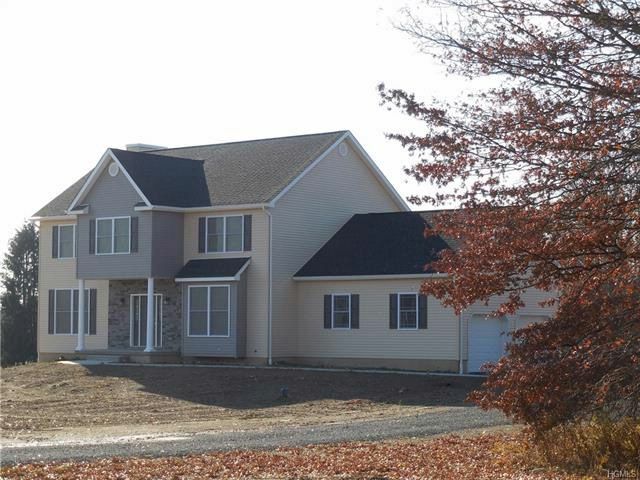 Private setting w/mature trees no thru traffic subdivision, total of 14 homes near Hamlet of Pine Bush. The property is in Ulster county. Concrete walkway.